It is not a perfect imitation, but, astonishingly, recognisable. It is the first scientific demonstration of an orca mimicking human words, which also included “Amy” — the name of Wikie’s handler — “Bye-Bye”, and “One-Two-Three”. “We were not expecting a perfect match, like a parrot,” researcher Jose Abramson of the Complutense University of Madrid said of the experiment reported Wednesday in the journal Proceedings of the Royal Society B. 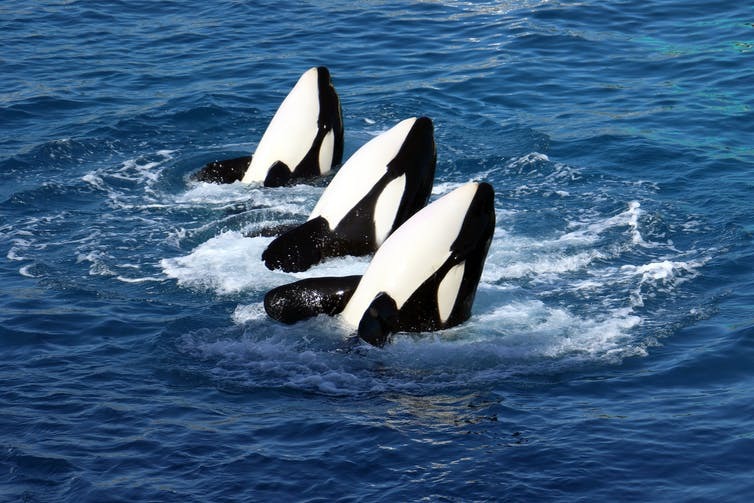 Yet in a trial with six different words or phrases, some of Wikie´s attempts were “a very high-quality match”, especially given that orcas´ vocal anatomy is “totally different” to ours. It was hard not to jump for joy when Wikie first “spoke”, Abramson told AFP, adding the research team had not quite known what to expect. Seeking to measure orcas´ ability to copy new sounds, Abramson and a team turned to Wikie, a captive killer whale at the Marineland Aquarium in Antibes, southern France. Trained to perform tricks for Marineland visitors, Wikie was a good candidate as she had already learnt the gesture commanding her to “copy” what her trainer does. As part of the trial, the killer whale was asked to mimic never-before-heard sounds made by other orcas with different dialects from different family groups. Then, she was made to repeat human words. In recordings of the experiment, Wikie takes several stabs at “hello”. Every time, she voices two syllables with something resembling an “l” in the middle and an “o” at the end. The most convincing attempt is a deep, throaty sound, a bit like a cartoon demon might say “hello”. The orca also manages an eery whisper that does sound remarkably like “Amy”. But she seems to have more trouble with “One-Two-Three”. The last syllable sounds a bit like a “raspberry” — that sound of contempt humans make by pushing the tongue between the lips and forcibly expelling air to produce a vibration. Abramson said the orca´s ability to mimic does not mean she understands what she is saying. The experiment was designed in such a way that no meaning or context was attached to any of the words. But it does show, once more, that orcas are very smart animals indeed, he added. Imitation skills are a sign of intelligence, as they allow animals to learn lessons from peers. The alternative, learning through trial and error, “can be very expensive… you can die just trying poisonous fish, for example, for killer whales. But if you learn from the experience of the others it´s safer,” said Abramson. “One of the main things that fired the evolution of human intelligence is the ability to have social learning, to imitate, and to have culture. This, in turn, allows a species to adapt more easily to changes in their environment, improving survival chances, said the researcher. Killer whales have previously been shown to mimic dolphin sounds. Apart from parrots whose copycat skills are well-documented, beluga whales, dolphins, seals, and an Asian elephant were previously reported to have tried mimicking human language.